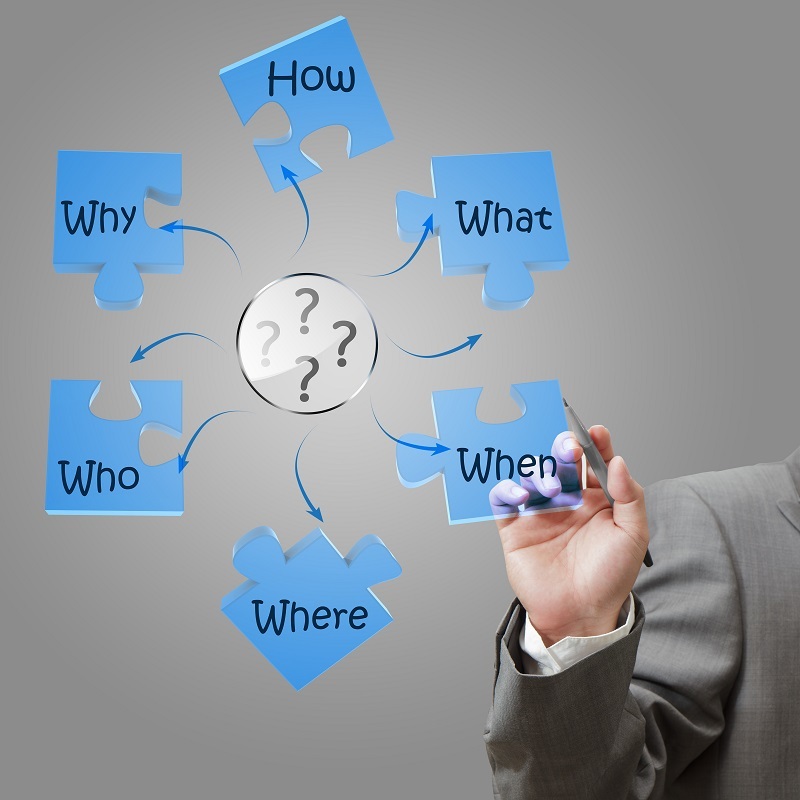 There are several recognized models for change management. Each model has its benefits and its sacrifices. Each model can, in effect, be tailored to a business and its leadership as indicated by Grant Shaw in his article 4 Change Management Models for Your Small Business. Some models have value as a communication tool to choreograph large-scale organizational change. This is useful during business process re-design/restructuring or if a company is re-branding. Others have value as an outline to structure continuous or targeted changes that happen on a much smaller scale. An example would be transforming the function of a specific department within a larger company. In her article The Advantages of a Small Business Over a Big Chain, Marie Kunz lists several natural strategic advantage over larger firms, which are tremendously beneficial when it comes to change. Small firms can adapt more readily to change as a general rule. They have a closer relationship with their stakeholders (i.e., customers, employees, suppliers, etc.). They also have a lot less bureaucracy when it comes to decision-making. Additionally, small business leaders/owners have the advantage of stronger relationships and communication with employees across all levels of the organization. These attributes significantly reduce barriers to change. The following change management models have proven to be effective in bringing about successful and sustainable change in companies, and can be particularly beneficial to small business owners. 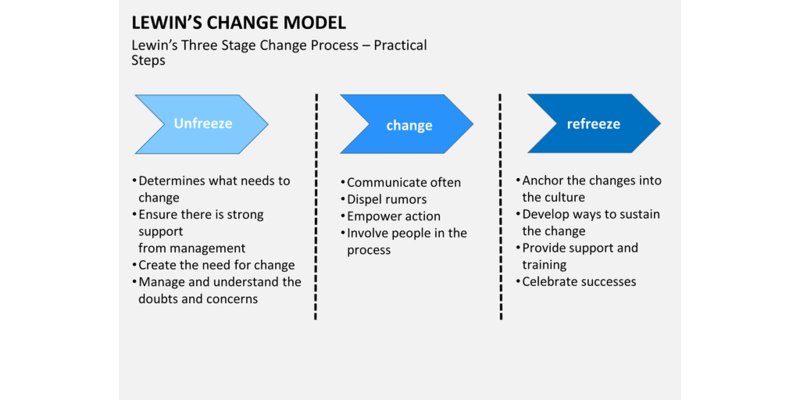 The Lewin model as described by Ben Mulholland in his article 8 Critical Change Management Models to Evolve and Survive, follows an unfreeze-change-refreeze model. It’s a simple, straightforward model that can be applied on a large or small scale. “Unfreezing” refers to assessing the current processes and procedures, and where they can be improved/adapted. It’s important that employees fully understand what was wrong or outdated about the current process. This helps with employee “buy-in.” “Changing” refers to the communication and education support systems necessary for employees to implement changes. The final step, “refreezing,” refers to solidifying the changes initiated. This includes measuring, adjusting, and supporting the new changes. It is critical that old habits don’t rise to the surface. This model is ideal for large-scale organizational overhauls or if a company needs an in-depth analysis and re-assessment to make big adjustments. ADKAR is a bottom-up approach which focuses on employees. This helps speed up the rate at which changes can be reliably deployed. By providing set goals to meet without a specific method, the ADKAR model gives a flexible framework which can be used in almost any situation. The added focus on the people and their needs rather than just the technical aspects also results in a higher success rate for changes you make. This flexibility also makes ADKAR great for deploying incremental changes, since small frequent changes are less disruptive, and can be planned out to achieve a larger shift over several ADKAR cycles. Both of the models can leverage the strengths of small businesses. The high contact with employees is needed to understand where current problems are in the “unfreeze” and “change” phase of the Lewin Model. 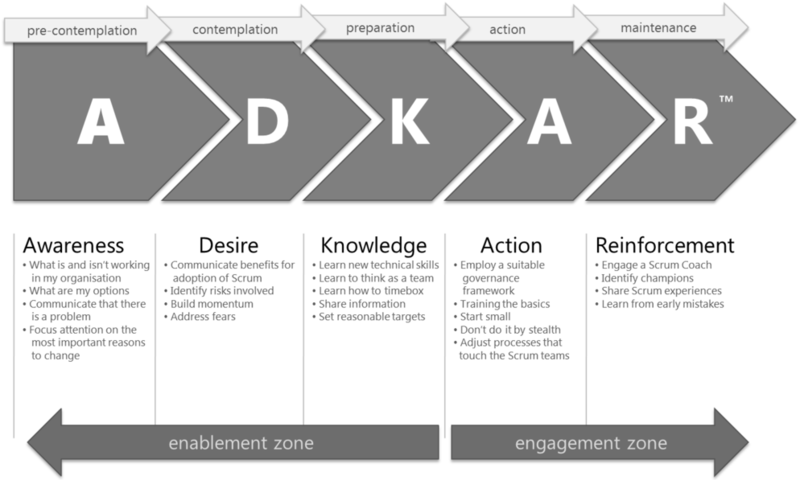 The “awareness” and “desire” phase of the ADKAR model require consistent and fluid communication which can more easily occur in smaller business where there are fewer levels of communication that have to be managed (i.e. fewer people to consider). The ability to make quick decisions regarding change is a very beneficial across all phases of these models. The quicker decisions can be made, the quicker change can take place. The quick turn-around on making decisions is particularly beneficial when taking action and solidifying the changes that are made. The phases in these models that involve action and solidifying change require resources and holding employee behaviors accountable to the new parameters of a change. Often times this requires strong leadership that is willing to pursue a change strategy. It is not only a possibility for small businesses to benefit from change, but they are naturally strategically positioned to do so. Megan Miller is a business writer at Aepiphanni, specializing in the fields of marketing, organizational development, and entrepreneurial strategy development. She has an MBA and a Doctorate of Business with a focus on International Business from Liberty University. Megan is currently active in article publications focusing on knowledge management in small and medium-sized businesses. She researches the topics of entrepreneurial cognition, international entrepreneurship, environmental scanning and knowledge acquisition processes of business leaders. Megan’s professional goals are to help small and medium-sized businesses become established and increase their competitive ability as a means for improving local and regional economies on a global scale. Megan has a passion for teaching and training young women to become successful in achieving their career goals. She currently works with the Wellspring Living Organization as a volunteer in their Women’s Academy to help educate women coming out of human trafficking and domestic violence lifestyles. She also enjoys traveling and experiencing other cultures with a particular affinity for Ireland and Italy.